Here are a few updates or changes to some recent Tool Times. 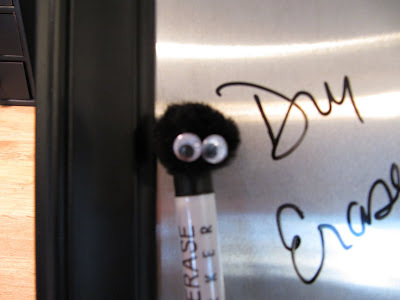 Remember the dry erase board tutorial when I added the pom pom to the marker. Well, now I added the eyes!!! Too cute..although I do think he's staring at me when I walk by...just kidding. Here's a red Valentine version...a small heart cookie cutter in the corner. 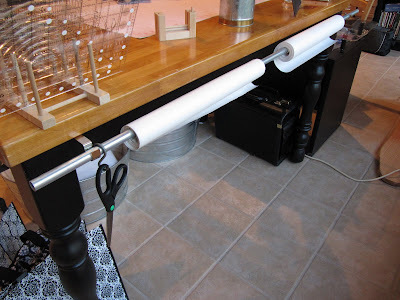 Remember the conduit pipe tutorial to hang things on...well, I put it on the back side of my table and added my rolls of freezer paper and iron on fusible web!! Here's Courtney demonstrating for me. The hook on the left holds the scissors when you need to cut the paper. Then I couldn't stop...I cut an old curtain rod that I had, because I was out of pipe, and hung that on the short end of my cutting table. I put on a roll of the brown craft paper that I use when I mail packages. 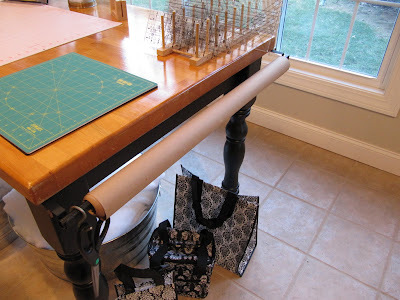 When I need the table for wrapping, I just clear the stuff on top and I can put on any gift paper on the rod and I'm all set. If you are going to do this, you will need a long rod holder. I had 2 silver and 2 black ones left over from old curtain rods. They stick out further to accommodate the width of the rolls. I still mounted them under the edge of the table. 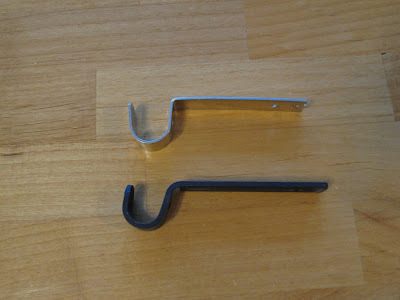 The curtain rod holders have the little screw that you use to tighten into the rod to keep it in place. 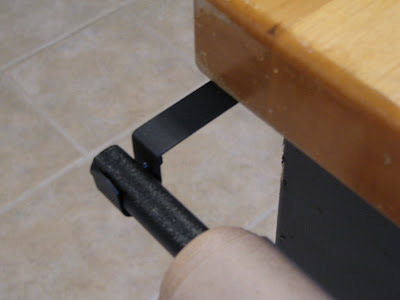 The rod won't move as you unroll the paper. You are just so clever. I really enjoy the Tool Time posts. You have some great stuff going on there!! 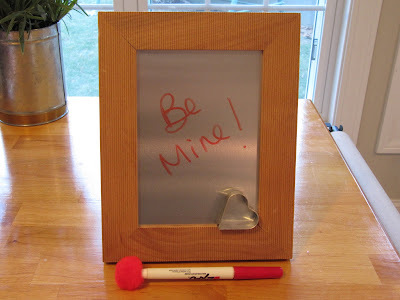 ok I need one of those little pens and dry erase boards! Great idea with the curtain rod! Keep them coming! I love, love, love organizing and taking it to the next level is even better. Great ideas! Clever ideas you have and sharing them with all of us not so clever people is so great thanks so much and please keep them coming!! 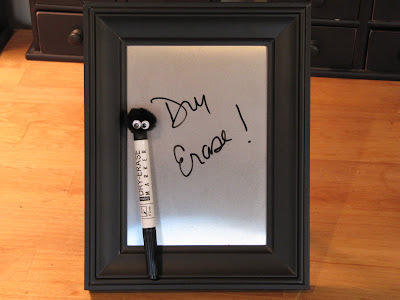 VERY clever and a great, doable idea! Thank you so much for making our lives easier. Love everything you do! Thanks for sharing. Have a great day! You have done it once again. I so love all this as I am trying to get organized!! This helps a lot. However, I made it a mission to find the step flashing you used for the framed notepads. I went to HD and Lowes and a local lumber yard, etc. and no one has them. I guess they come in a box of 50. I just don't know where to get them. Darn it! I loved this idea and was going to make a few for friends and me, of course. Bummer. What a clever idea, I'm stealing it. I just found your neat blog and am happy that I did. I love all of your wonderful organizational skills. Thanks for sharing! Once again some wonderful ideas! Love the eyes on the pom pom, so cute!! OMG!! You're just the handiest lady with the coolest and most practical ideas! Where did you get that awesome table???? Just a note about sources for cheap hardware. If you live near a BIG LOTS store (formerly McFrugals, both "overstock" stores) they have a lot of curtain hardware often cheaper than walmart & better brand names. They have spring rods, clip rings, & fancy decorative items too. Good source for cheap bins as well. 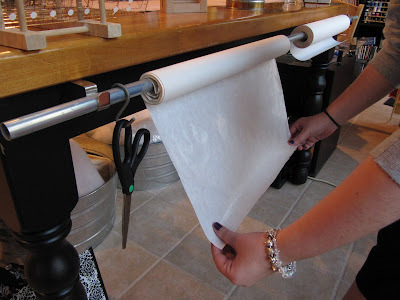 Now I love this way to hang the freezer paper, & great place to wrap gifts as well! Thanks again. I am so jealous of your craft room! OMG I loveee your Blog! !